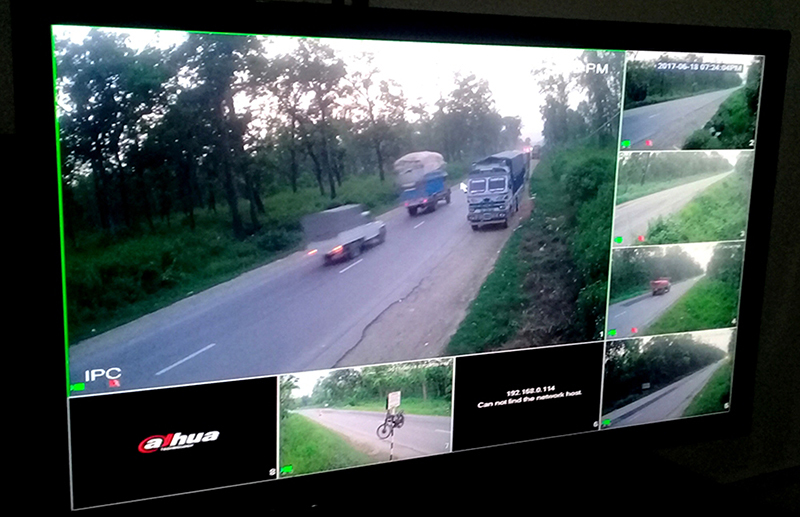 CHITWAN, June 19: Closed circuit (CC) cameras installed along the wildlife corridor connecting the Chure and Mahabharat hills in Chitwan frequently capture the footages of parked vehicles, passengers urinating facing cameras and vehicles sometimes hitting wild animals. Movements of various sorts of wildlife like tigers, rhinoceros, spotted deer among others inhabiting the Tikauli forest are a common sight along the corridor. The corridor that lies in between the Bharatpur Metropolitan City and Ratnanagar Municipality along the East-West Highway is taken as the most sensitive zone in view of the wildlife conservation. A total of 10 CC cameras have been placed along the seven kilometers Tikauli section of the corridor. Currently, only six are functioning. The objectives of installing CC cameras is to make drivers aware of the sensitiveness of the area and drive incessantly but in a slow speed so as not to disturb the movement of wildlife, to bring a rule violator to book and for the waste management, but they are far from achieved. The CC camera footages captured from the Armed Forest Guards Training Centre here were showing vehicles parked haphazardly on the route and people defecating in jungle and on the roadsides, and waste materials thrown here and there. Such scenes have neither promoted the Chitwan National Park (CNP) to take responsible steps to stop this nor drawn the attention of other organisations to control such activities, Tikauli forest ranger Saroj Kalfe said. On the other hand, incidents of wildlife getting killed after being hit by vehicles due to the negligence of the drivers have been increasing annually. But the paradox is that the cameras have only occasionally captured such criminal incidents and road fatalities. According to the Armed Forest Guard Training Centre, the cameras were sometimes shut at the time of the incident while at other times they were dysfunctional due to lack of power. At other times there were miscellaneous problems with the functioning of the cameras. It is also that some incidents have occurred outside the range of the cameras. Warrant Officer 1 at the Training Centre, Ram Dayal Saha opined that tough action should be taken in response to the footage of such incidents captured by the cameras. In the first phase when the campaign was launched the driver used to be provided with information and then warned of action if he/she did not oblige the rules and directives. Ram Chandra Kandel, the chief conservation officer at the CNP, acknowledges that there are some managerial weaknesses which would be addressed. He said the forest guards are even given bicycles for patrolling and the CNP was serious to this issue. The chief conservation officer also stressed that all the stakeholders including the District Forest Office, the local administration and the CBOs should pay attention to this aspect. Chitwan district forest officer Kedar Nath Poudel said the problem is also because the CC cameras do not work at night and some are out of order. The CNP had started surveillance using CC Cameras for the effective conservation of wildlife in the Tikauli forest area that lies on the Bharatpur- Ratnanagar wildlife corridor on 14 July 2016. Various awareness programmes with the participation of the national park officials, the army, forest guards and representatives of different organisations were held on the highway itself for about a month since the launching of the campaign. The drivers were informed about the campaign and warned of legal action if they disobeyed the wildlife corridor rules and regulations. The programme was found quite effective for a month. Throwing of trash in the area stopped. The drivers would not normally stop their vehicles. Even though they stopped, the forest guards would remind them of the rules and regulations. But the campaign gradually lost its steam with the passage of time and came to the present stage.